Rich & Results Health & Performance profiled in the Daily Mail – Pro’s and Con’s of Yoga for Women! Well, well, well…..that was fun! I’m thrilled to announce my opinions on the ‘Pro’s and Cons of Yoga for Women’ were profiled in a feature article for the Daily Mail yesterday. Read the full article by CLICKING HERE – Bianca is a top writer; I’m delighted that we’ve both had brilliant feedback. A whirlwind experience – I’m very lucky to have the opportunity to give my opinion on this very current and hotly-debated fitness topic for a big-time news outlet. There was just one catch, however. I’d have only 1 hour to produce the goods to help Bianca hit her deadline. Presented with an opportunity like that though, there’s only one call. Now, the topic of yoga is not necessarily my go-to conversation-starter. But, because I’m a bit of a research nut and spend an hour or so most nights reading about health & fitness ‘for fun’ (& so you don’t have to), I’m confident I can give an insightful, evidence and experience based opinion on most things to do with the profession. 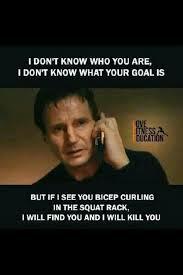 Just don’t ask me to tell you that 1-Leg Dumbbell Curls on a BOSU ball in the Squat Rack are a good idea though. For those interested in the topic of yoga, or considering giving it a try – below, I’ve outlined the whole series of points I made that encapsulate my view. I’m giving you the full version, as the final flow of the Daily Mail article (with all the good pics of celebrities in crazy yoga poses, etc.) didn’t allow for everything to fit. Yoga is the ‘in’ thing. It seems like every celebrity is doing yoga; people usually have strong positive or negative attitudes towards it. If you’re thinking about trying yoga but aren’t sure if it’s for you, here’s my take on the pros and cons. As a Health & Performance Specialist, I’m all for anything that gets people enthusiastic about exercise and gives people an outlet to relieve stress. If you’re not moving, you need to move – regardless of what it takes to do so. Undeniably, yoga can offer some amazing benefits. 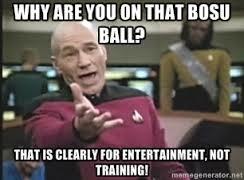 However, those benefits are only realised when it’s taught correctly and tailored specifically to the individual. Otherwise, at best, yoga can be marginally helpful and at worst, dangerous. Yoga relieves stress and reduces anxiety. Everyone stresses out from time to time. I feel calmer, more composed and happier when I do yoga-type exercise regularly. Between the deep breathing, flow of new postures and positive affirmations, you’ll undoubtedly feel better for giving it a try. Yoga gets people moving. If performed safely and correctly, yoga-type movements are a fantastic component of a holistic approach to achieving health and physique improvement. You can increase your flexibility, stamina, strength and confidence. Yoga can be good for the brain. Advocates of yoga and meditation say it’s great for your mind. Yoga is claimed to boost your memory, help you focus and increase the blood flow to your brain. I’m a huge advocate of corrective exercise – movements that improve your flexibility, mobility, posture and stability. 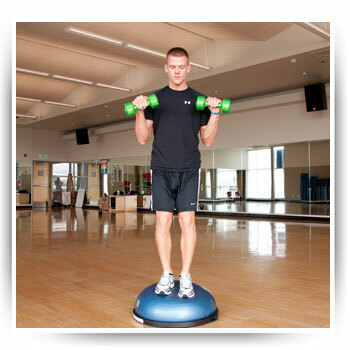 All my in-person and distance training clients use these to prime themselves for exercise. We improve posture and performance by lengthening classically tight muscles and strengthening typically weak areas. The ‘Downward Dog’ is a classic yoga exercise. It works on stability, flexibility and mobility in all the right areas. Everyone asks me how the corrective exercises we do at Results Health & Performance are different to yoga. Proper corrective exercise (like the ‘Restore’ package for RHP clients) is similar to, but ultimately differs from yoga, for these main reasons. Yoga rarely differentiates between good and bad range of motion. Certain joints in our body – the ankles, hips, and upper back for instance – require more mobility training because they’re too stable/tight. Conversely, some joints – notably the lower back and shoulder joint – require a lot more stability training because they’re too mobile. Every joint in our body is designed to function with a delicate balance of mobility and stability; some need more of one than the other. My main concern with yoga is the tremendous amount of lower-back bending that occurs; this is the last thing you want if you have back pain. Most back problems arise when we get too much movement in the lower back because we lack mobility in the hips, or our core and glute strength is too low to prevent excessive arching or flexing of the lower back. 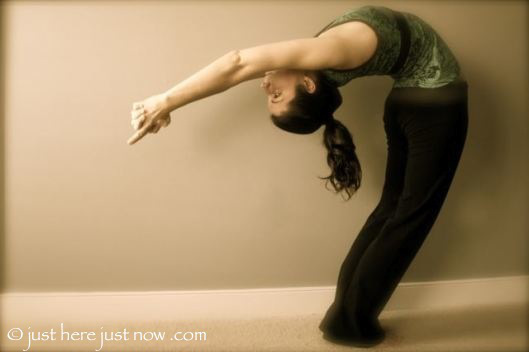 Yoga can over-use the wrong muscles when performed incorrectly. For example, the hip-flexors are heavily recruited in many yoga moves. This can be an issue, considering most yoga enthusiasts are female (though plenty of men do yoga too). Women naturally tend to carry their weight too far ‘forward’ and have a tendency to over-arch the lower back because the hip-flexors (the muscles that help us raise our legs) are too tight (sitting at desks all day doesn’t help). We don’t want to compound this potential issue. Many yoga movements only train flexibility – not mobility. Mobility implies that you are stable in the range of motion you achieve in movements. Having excessive range of motion without supporting strength is a big risk for injury, so too much static stretching for flexibility can be a problem. Being very ‘limber’ is sometimes a give-away that you’re too ‘unstable’. Excessively limber people get injured with ordinary activities like carrying groceries, and can easily break down in sports and worsen existing aches and pains if applying advanced yoga moves in the wrong areas of the body. For example, I almost never stretch female clients’ hamstrings. In exercise, most women tend to recruit their thigh muscles ahead of their hamstrings by habit. When you stretch the hamstrings they initially get slower and weaker, forcing the thighs to take over. Real-world translation? Your ACL (most common knee-ligament injury for ladies) has to do more work. ACLs pop much more easily in females due to biomechanical differences in their body types compared to males – I want to help avoid this. There are more effective ways to invest your exercise time. Most of us lead very busy, modern lives. We want to look, feel, move, and perform at our best, and improve our health, physique or sports conditioning in the most time-efficient way. Most women already have enough flexibility. I believe targeted dynamic mobility work and corrective exercises will give a lady all the flexibility she needs. To get the most ‘bang for your buck’, instead of yoga, women are better served improving core stability, fixing postural imbalances and improving their strength through resistance training and metabolic conditioning. Consistency, effort and determination in these areas are what get results. In summary – if you like the sound of yoga, have no glaring postural issues or musculoskeletal injuries and want to see what all the celebrity fuss is about, there’s no harm in finding a decent practitioner and having a go. Be sure to remember however, that yoga is just one of a number of elements that a holistic health, physique transformation or sports conditioning exercise program should contain. Other areas, like resistance training for strength and metabolic conditioning for fat burning, are where you should invest most of your effort. Got any questions? Give me a shout on Results Health & Performance’s Facebook and Twitter pages or in the comments section below – I’d love to hear your views. Overall, I’m really pleased with the way the article came out and the feedback I’ve received. Either I came up with some decent stuff (or I must have made Bianca’s day a tad easier…) because I’ll be giving more opinions and writing articles on health and fitness for the Daily Mail in future – watch this space!